German social gaming firm Wooga is on a serious roll–and attracting top tech talent–despite flouting the compensation structure you’d expect to find in the competitive industry: It doesn’t pay performance bonuses to its quickly growing staff of 150. BERLIN – German social gaming firm Wooga is on a serious roll–and attracting top tech talent–despite flouting the compensation structure you’d expect to find in the competitive industry: It doesn’t pay performance bonuses to its quickly growing staff of 150. Budgets for teams to have group dinners and to set their own office group décor. Monthly paid dinners for four-person tables from various groups, so the whole company can get to know each other, even people on different teams. Recognition of employee birthdays with signed cards and thoughtful gifts. Either an iPhone or iPad for Christmas, for every employee–an appropriate gift as it aims to enter more mobile platforms this year. An educational budget of 1,500 euros per employee to attend conferences, take a class or lessons related to work. Company-sponsored off-site parties when the company hits targets. Hosted internal development classes, such as public speaking and German. Choose-your-own computer hardware and roomy offices in a former bakery with high ceilings and no dress code. Recruiting perks for employees who bring someone else into the firm, including flat-screen TVs, cameras, and iPads. Larger U.S. social gaming rival Zynga, by contrast, is known to give top performers lavish gifts such as vacations or $100,000 in vested stock. The New York Times reported last year that Zynga is known for a hard-charging, competitive environment, where the 4,000 employees work in autonomous game teams–such as Farmville, Poker and Cityville–like “a federation of city-states.” Employees work long hours and managers track progress fiercely, demoting or laying off weak links. Zynga also reduced some equity packages through demotions. Some industry veterans predict such management practices could result in a talent exodus for Zynga. She joined Wooga in November from another German gaming firm called BigPoint, which did pay bonuses to employees. Wooga, she says, is an exception in its no-bonus practice. “This is really unusual,” she says. She says only a few employees have left Wooga and it is largely for personal reasons, such as moving with family to a different city in Germany. So far, the management strategy, along with its game design talent, is working for Wooga. It saw 185% user growth in 2011 to 40 million monthly users, up from 14 million in January 2011. That ranks Wooga as the third-largest social gaming company on Facebook, behind Zynga and Electronic Arts. Dallas-based research firm Parks Associates estimates that social gaming will be a $5 billion market by 2015, up from less than $2 billion in 2011. Roughly half of Facebook’s around 500 million “daily active users” play social games, according to Clipperton Finance in London. Wooga plans to hire 100 more employees this year to its existing staff of 150, largely to focus on mobile games development. Wooga’s four Venture Capital investors–Highland Capital Partners, Tenaya Capital, Balderton Capital and HV Holtzbrinck Ventures–have put $32 million into Wooga so far. As Facebook plans for an IPO, they hope to see their investment in Wooga grow. As a private company, it does not share revenue and profit numbers. 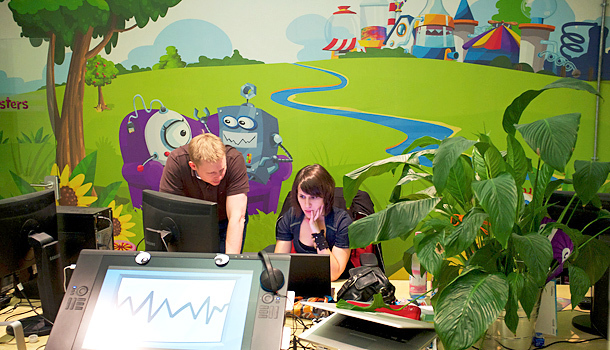 Wooga is one of the shining stars in the Berlin tech scene. It’s churned out several free Facebook casual game hits including DiamondDash, Bubble Island, and Monster World. They make money by selling gear like magic wands inside the game, and from advertising. The office is set up in a way where teams of 20 designers, programmers, and artists work on a game and share knowledge with other teams to help cross-promote games. He and other video game executives in Europe say the culture of collaboration on strategy is typical of European startup management as well as European game play, as opposed to a more capitalistic winner-takes-all game style in the United States. “We work very much with each other rather than against each other,” he said. “We believe in competition–but more in competition with competitors, not in competition inside the company.” And he may not be alone in such philosophies.